As a technology industry analyst, I attend many different kinds of events; some public, but many more private. 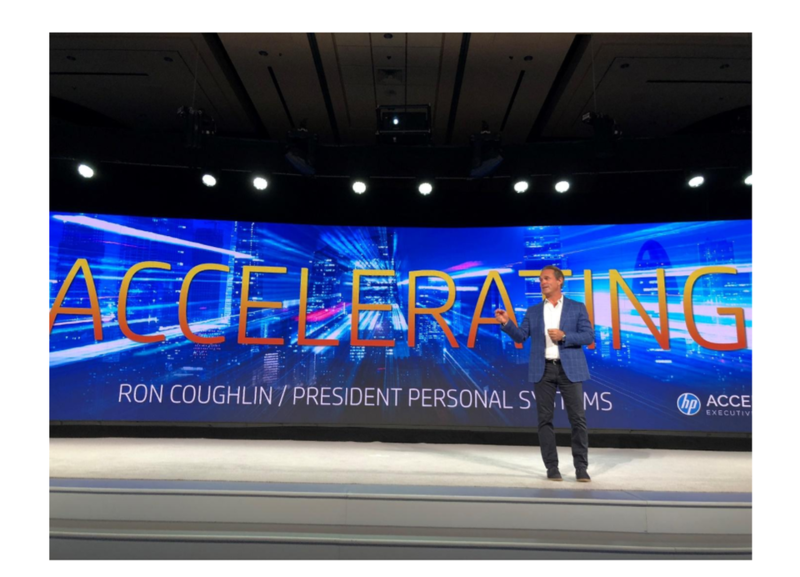 I recently attended HP’s Executive Forum held in Las Vegas, where HP Inc. brought in its North American channel partners to discuss HP’s roadmap and mutual business opportunities, short and long-term. I was told this was the first year that press and analysts were invited (it was historically a private event), so I didn’t quite know what to expect. HP boasts that 87% of its business goes through the channel, so this isn’t an afterthought or side-show—it is the business. This doesn’t mean HP doesn’t have direct relationships with its customers; it does, but most of its business gets fulfilled through consumer and commercial retail channels. While I cannot disclose everything I learned at the show, I can talk about what is public. One of the more interesting takeaways was that I learned as much about the company culture as I did about its new products and markets—this in itself made the event well worth the time. 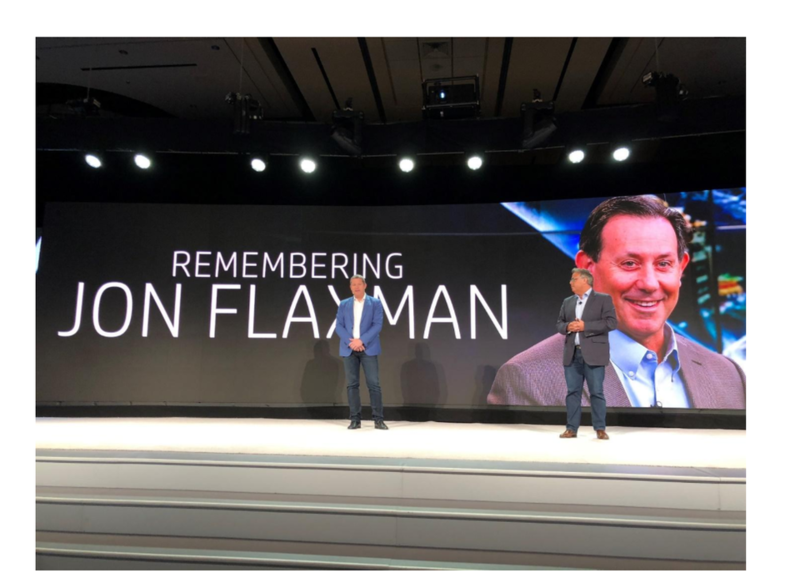 Before we dive into the next products and business, I wanted to talk briefly about Jon Flaxman, HP’s COO who passed away on March 28th. His recent passing hung heavy over the event. CEO Dion Weisler had many kind words to say about his friend on the main stage at the event, calling him a defining leader who had a huge impact on HP and its channel business over his 36+ year tenure with the company. Weisler announced that HP had established (along with Flaxman’s family), the Flaxman HP Inc. Endowed Scholarship Fund at Flaxman’s alma mater, Washington University’s Olin School of Business. It was a heartfelt send-off to someone who was clearly an integral part of the HP family, and it was one of the moments where I felt like I learned a lot about HP’s close-knit company culture. The people driving HP Inc. are real people, with close personal relationships that transcend the dog-eat-dog corporate structure typically found in companies of this size and influence. I found this segment to be quite touching. HP’s Ron Coughlin, President of the Personal System group kicked off the product and strategy content. 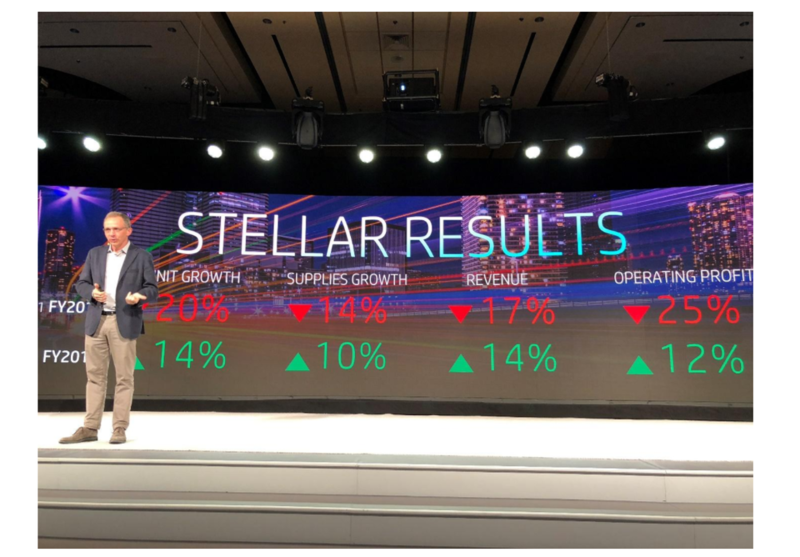 With a profitable #1 market share, HP has a lot to cheer about and I was impressed at some of the stats I heard during his pitch. Gained 7.0% of profitable premium unit market share since 2013 This likely came at the expense of Apple as Apple owns most of this share. (Source: Q417 IDC, Includes Workstations excludes detachables). Gained 3.2% consumer premium and 1.3% commercial premium unit share from Q3 2016 to Q4 2017. In Consumer Premium (>$800), from Q3 2016 to Q4 2017, HP gained 3.2 market share points. (Source: Dec’17 NPD & Gfk sellout. All Quarters exclude APJ DT, *Excluding Detachables). In Commercial Premium (>$1,000), from Q4 2016 to Q4 2017, HP gained 1.3% market share. (Source: IDC Q417). Consumer share gains likely came from Apple and commercial from Dell. Needless to say, this was a good place for Ron to start with a deserved victory lap. HP announced a slew of new consumer-targeted personal computers at the event, including new gaming laptops. HP already has the Omen brand for extreme gamers and as I said before, to my surprise, announced it’s currently a billion-dollar business. Like Dell and Lenovo, now HP is introducing more mainstream gaming systems for casual gaming, the new HP Pavilion Gaming line. Our gaming analyst Anshel Sag will be going into depth on these new offerings, so, for now, I’ll just do a fly-by. We’ll start with the new HP Pavilion Gaming Laptop 15. HP says this laptop features “rock-solid” hardware or gaming, content creation, and productivity, without sacrificing the device’s portability. The new notebook features impressive compute power, with up to 6 core mobile 8th Gen Intel Core i7+ H-series processors, or up to quad-core mobile 8th Gen Intel Core i7 U-series processors. It also comes in a variety of powerful storage options, and sports excellent graphics—up to NVIDIA GeForce GTX 1060 with Max-Q Design or AMD Radeon RX 560X. All configurations boast ultra-fast Wi-Fi connectivity, thanks to the notebook’s 2×2 antenna, and feature the option of supporting Gigabit speeds. 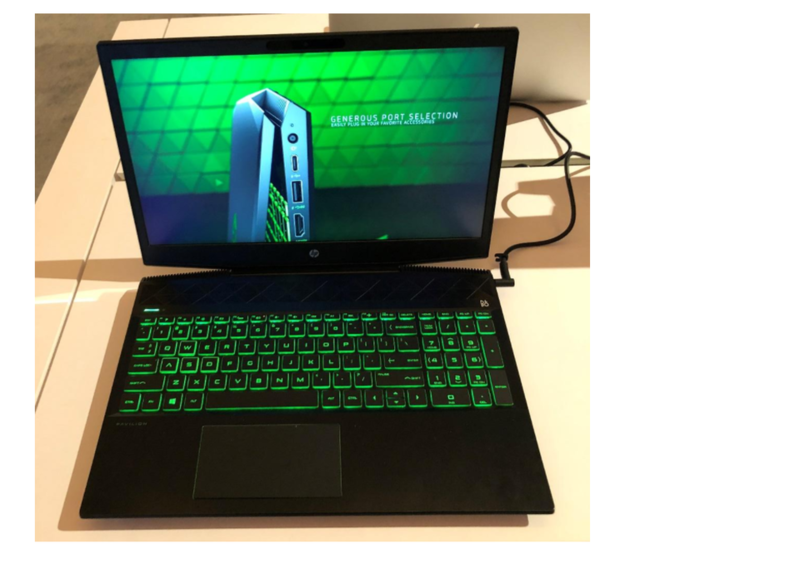 In addition to the Pavilion Gaming Laptop 15, HP also announced two new desktop editions: the HP Pavilion Gaming Desktops 690 and 790. These desktops are also offered in a variety of storage options and feature what HP calls “an amazing audio experience” with 5.1 surround sound support, and HP Audio Stream to allow devices to play music through the PC’s speakers via Bluetooth. The 690 runs up to 6 core 8th Gen Intel Core i7+ processors or up to 2nd Gen AMD Ryzen processors, and supports as much as 16 GB of DDR4 RAM. The bigger, more powerful 790 runs up to 6 core 8th Gen Intel Core i7+ processors and supports all the way up to 64 GB of DDR4 RAM. As far as graphics go, the 690 sports GPUs up to NVIDIA’s GeForce GTX 1060 or AMD Radeon RX 580, and the 790 supports up to NVIDIA GeForce GTX 1080 or AMD Radeon RX 580. I thought the industrial design of the units looked pretty good, particularly the notebook, and am looking forward to taking one for a spin. The systems start at $799 which is of course, low for a gaming system, but consistent with house-brand gaming extensions. Lastly, for gaming, HP announced the new HP Pavilion Gaming 32 HDR11 Display, which HP says will be ideal for gaming, creation, and entertainment. The display boasts great visuals and quick refresh rates and sports Radeon FreeSync technology, which synchronizes the GPU with the display to alleviate stuttering and tearing in gameplay. I need to do some work to see how FreeSync works with GeForce cards. While HP ENVY and Spectre tend to get all the consumer glory, the Pavilion brand is really where all the tonnage and volume is. HP announced a major revamping of its Pavilion line, outfitting its convertible, notebook, and desktops with new premium features and design. All the updated devices feature “refined materials and finishes, thin bezels, and stepped-up performance.” I think jazzing up the Pavilion line is a smart idea—they’re great computers, and giving them a more premium look and feel will only serve to strengthen their appeal. First, let’s talk about the HP Pavilion x360 14 and 15-inch convertibles. The new devices come in a variety of premium colors and feature a narrower bezel design than their predecessors. They are powerful, offered with 8th Gen Intel Core i5 and i7 dual and quad processors, and feature discrete graphics options. Some of the 14-inch models have an NVIDIA MX130 Graphics option, while some of the 15-inch models feature an AMD Radeon 530 graphics option. Another premium feature available to select models is a Windows Hello-enabled fingerprint reader. It’s nice to see the AMD Radeon options in there as they deliver a very solid gaming and GPU compute punch. Next, the updated Pavilion 14 and 15-inch notebooks. The new notebooks are available in an astounding variety of new colors (including numbers like “Velvet Burgundy” and “Tranquil Pink”) and are the thinnest generation yet (with a decreased thickness of 2mm from the prior generation). The notebooks feature a metal keyboard deck and cover and a diamond cut trim for the touchpad—this just screams premium. HP has also migrated over the “lift hinge” from its premium ENVY line, for an improved typing experience and better airflow and cooling. You can purportedly get up to 11.75 hours of battery life on the notebooks (dependent on the model), and they feature 8th Gen Intel Core processors or the latest AMD Ryzen Mobile Processor. When it comes to storage, these notebooks feature up to 512 GB of SSD or, for the 15-inch option, up to 2 TB HDDs. Dual storage configurations are also available, as is Intel Optane memory for storage acceleration (on certain models). The notebooks feature dual speakers tuned by B&O Play, with HP Audio Boost, for, in the words of HP, “rich, authentic audio.” I was very glad to see Intel Optane and AMD Ryzen accounted for as performance and choice are important. Optane will help in any application where you are loading big amounts of data like video editing and gaming. Ryzen Mobile is some of the best quad-core notebook technology consumers can get, period, and provides bar none the fastest graphics you can get integrated into a notebook CPU. 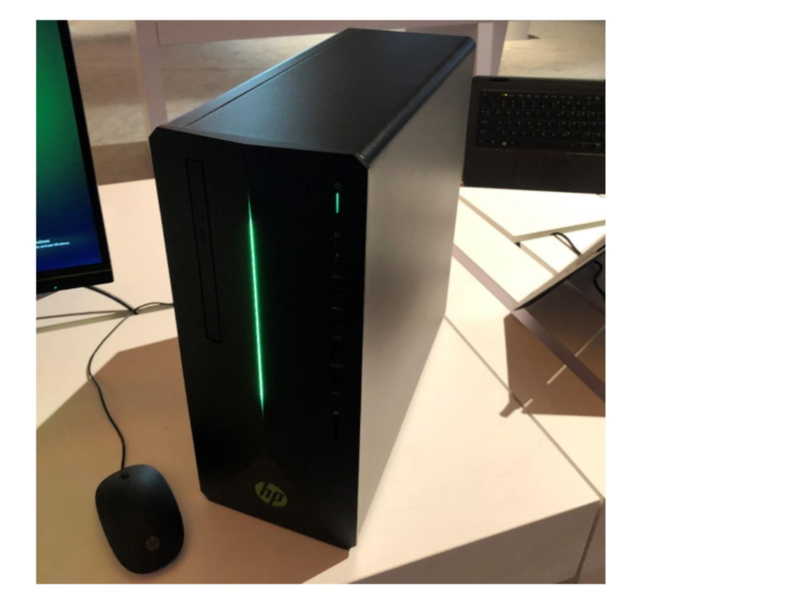 Lastly, HP unveiled the 2018 HP Pavilion Desktop portfolio. The updated portfolio is more space efficient than previous generations, with a 10% depth reduction. These PCs have also been “premium”-ized, with several new front panels and bezel design options, in Ash Silver or Natural Silver. These desktops don’t skimp on the power, with options up to 8thGen Intel Core i+ processors or the 2nd generation AMD Ryzen processors, and a variety of admirable storage drive options. The graphics also look to be solid, with options up to GTX 1060 or AMD Radeon RX 580 cards. Overall, HP pulled what were once premium features into its mainstream line at an affordable price, all consumer goodness. 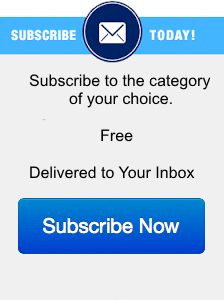 Sometimes companies hesitate to do this to protect the premium lines, but at their peril. Smart companies like HP know they just need to improve their premium lines so those features won’t be missed. You can’t talk HP without talking printers. HP’s printer division is a real success story, and I have to give credit to Enrique Lores and his team. Together, they’ve managed to clean up the channel, revamp design, increase printer relevance with custom CPG and retail shelf packaging markets. HP’s Sprocket photo printer was a surprise hit (in my opinion). All in all, it’s been a very impressive turnaround of the division. 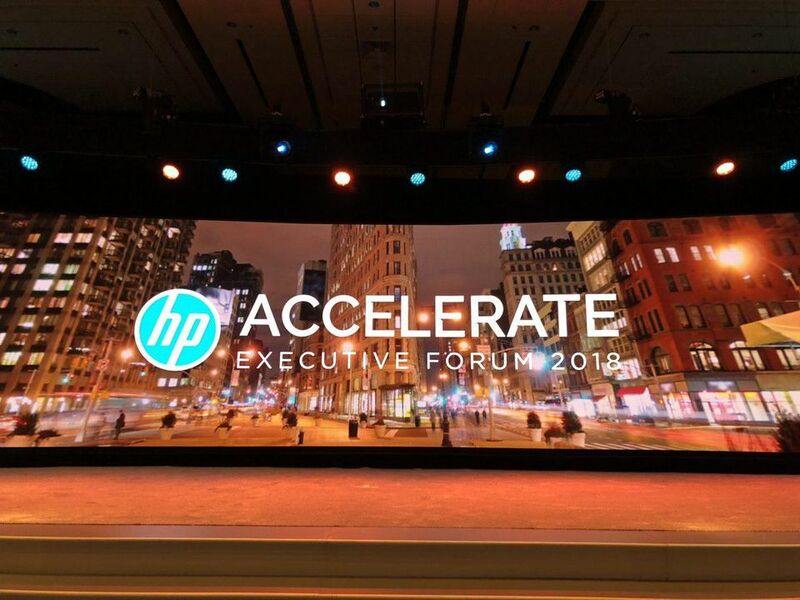 HP took the opportunity at the Executive Forum to make a handful of announcements in this realm. It announced new PageWide A3 SKUs for both transactional and contractual channels, a nice expansion of its A3 multifunction printer line. HP also announced its new Accessibility Assistant, which the company says will utilize conversational voice technology to improve the usability of HP products for people with a variety of cognitive, physical, and vision-related disabilities. In printer security, HP also announced new enhanced integration into existing IT security monitoring tools frequently used for PCs, including McAfee’s SIEM, and endpoint protection and management platforms like Microsoft SCCM (System Center Configuration Manager). In the modern era of cybercrime, printers have to be secured like any other device endpoint—it’s good to see HP attempting to make this easier for customers. Integrating printer security with the same tools used for PCs is a smart move that should help streamline security efforts. I wrote not that long ago about HP’s expansion of its voice printing capabilities to include Amazon.com Alexa compatibility (read more here, if interested). 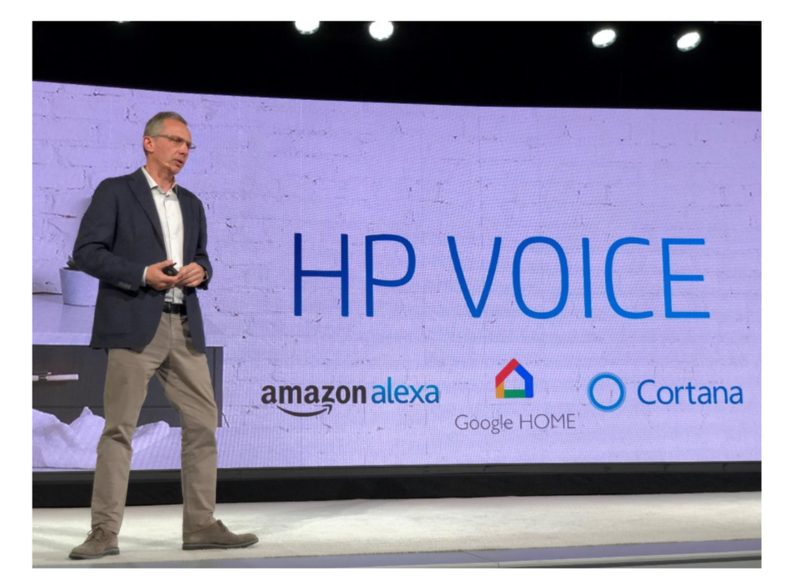 HP also announced at the event that it would be expanding voice assistant support internationally, in the U.K., Ireland, Australia, New Zealand, and India. I see this as a very useful capability for voice assistants to have, and I’m not surprised it’s taking off. HP’s Enrique Lores reiterating HP’s commitment to voice accessibility. There’s also been some noise in HP’s 3D printing department lately—I wrote recently about several of the company’s new offerings in the arena. HP gave a progress report last week on its 3D printing efforts, claiming an industry-wide acceleration of 3D printing for the manufacturing of end-use parts and large-scale prototyping. HP claims that more than 3 million Multi Jet Fusion parts were produced in the last year alone and that many of its customers, including Forecast 3D, GoProto, and Stern, have ramped up their Multi Jet Fusion capacity to meet the rising demand. HP also announced a program called “Reinventing HP With Multi Jet Fusion,” in which the company will utilize its own 3D printing technology to improve product life-cycles across its many product lines. HP says that the technology and its ability to perform more on-demand production will help lower costs and waste. HP’s ink and 3D printer divisions just keep the beats going and after seeing some of the NDA futures, I feel very confident in their future. There was obviously a lot to chew on at HP’s Executive Forum 2018, and I’m glad I got the opportunity to attend. It was great to get a look at all the new additions and updates to the company’s product lines, but as I mentioned at the outset of this article, some of the biggest takeaways for me were the insights into the company’s culture at large. Seeing the human relationships at the heart of the company’s leadership goes a long way towards explaining why HP is still on top of its game after all these years (though the fact that it also continues to churn out strong products and updates certainly doesn’t hurt). Nice work, HP, and looking forward to next year.